Hold up. She's not dressed in all black? Yes, that's right. This happens to be one of the rare occasions where I'm actually wearing something that's not black. With having a reputation for the lack of colours in my normal outfits, for this week's post I thought I would spice things up a little and go for something out of my comfort zone. Spring is finally here, which for me means I can be more adventurous with outfits without having to sacrifice fashion for warmth. It also means I am FINALLY able to whip out the classic button down white shirt without having to distract the crisp, clean vibes it gives off with layering pieces. I had previously been hunting for the perfect white button down shirt but luckily for me, that hunt ended during Summer last year as I found this little gem in a Zara in Indonesia. It definitely ticked all the right boxes of being comfortable, not too fitted and not too long or oversized. It definitely was one of those moments where I would've been a fool if I didn't take home this shirt with me. 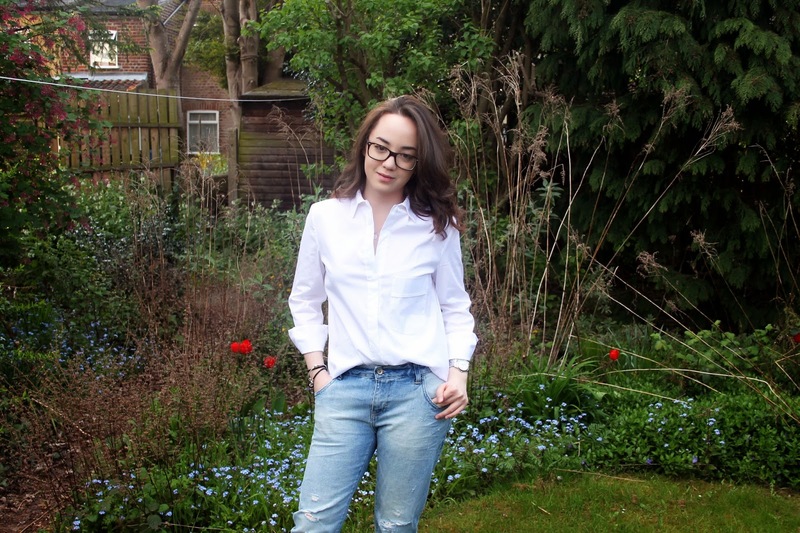 Sometimes button down shirts that have a little more structure to it (like this one) can make an outfit look a little more corporate and very dressy. I wanted to show through this outfit how you can break away from that by dressing it down with a pair of boyfriend jeans and sneakers but still keeping a clean, casual look without the compromise of looking sophisticated. 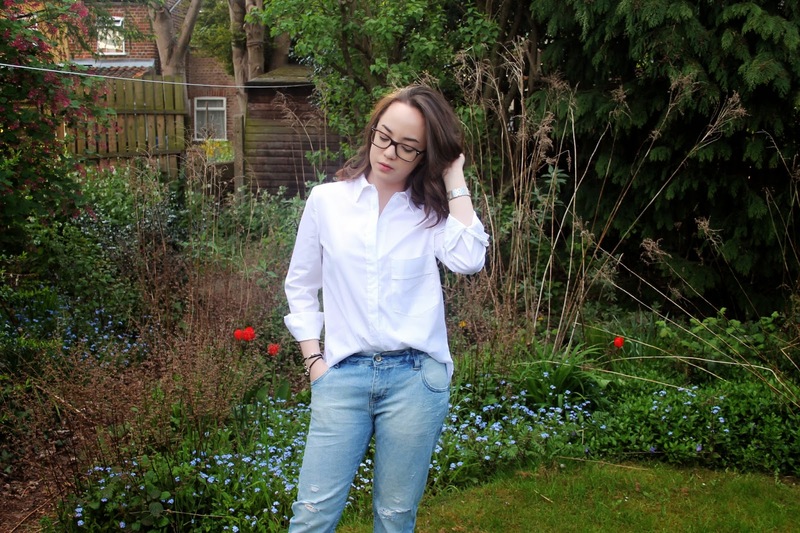 Being the kind of girl used to the skinny jean trend, having my first pair of jeans that were a relaxed fit and just generally the complete opposite was a weird but good addition to my wardrobe. It was also the first time I had introduced the "distressed" element in my jeans which I was cautious about at first as it's not really my style to have super shredded, overly distressed jeans. Luckily, I found this tastefully distressed pair that ticked all boxes for me from Zara. I couldn't be happier with the fitting, light denim wash, amount and positioning of where it is distressed. Similar to the white shirt, it is easily a piece that can be dressed up or dressed down making it a versatile wardrobe staple. 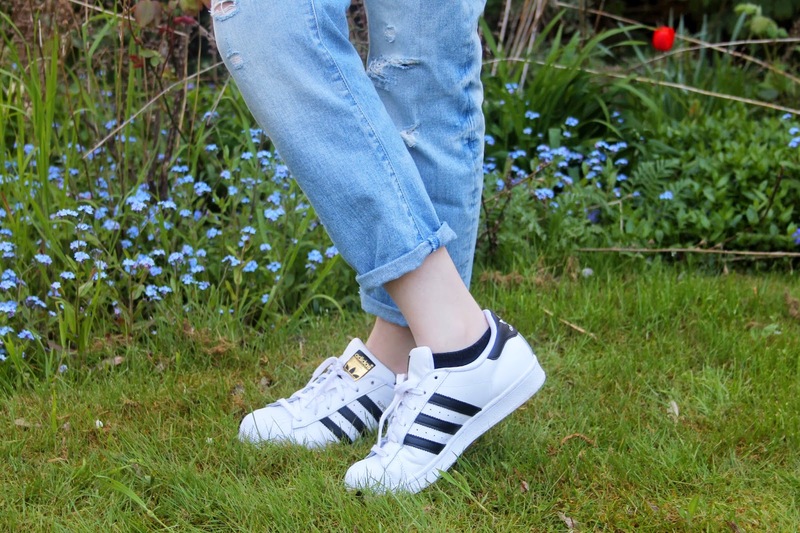 It was enough to convince me that every girl should have a pair of boyfriend jeans in their wardrobe. These shoes were my most recent shoe purchase and are hands down my favourite pair out of my sneakers already. Once they became a part of my shoe collection, it was so hard to remove them from my feet - I couldn't stop wearing them. 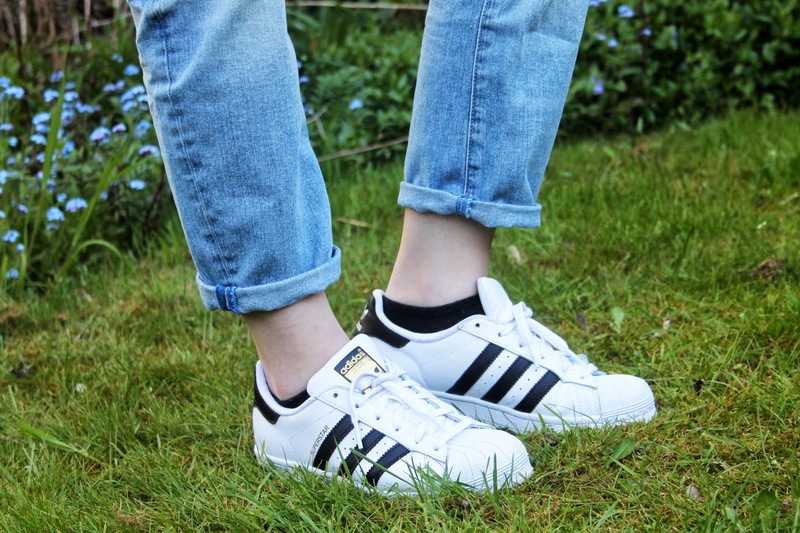 It's no wonder they are such an iconic style of shoe; they are clean, minimalistic and make any outfit. They were actually the main inspiration for this week's outfit. 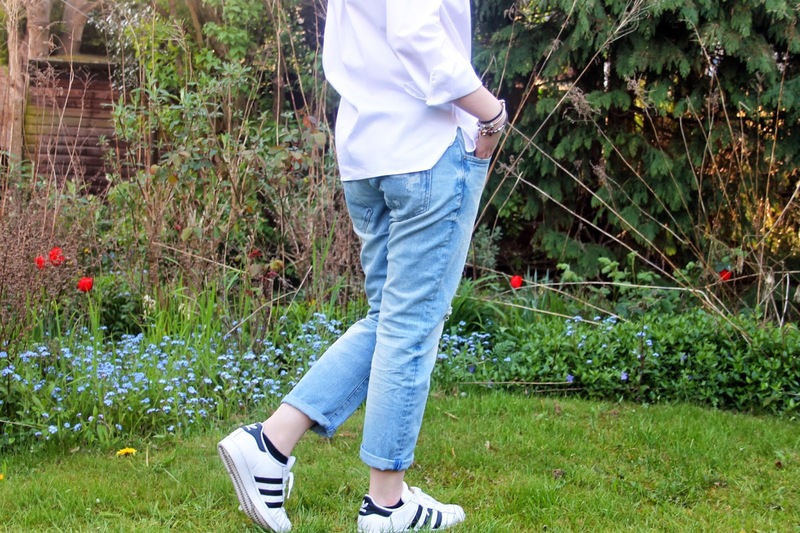 I definitely knew I wanted to feature them when it was my turn next to blog and was determined to style them with contrasting clothes that aren't normally associated with the sporty style. 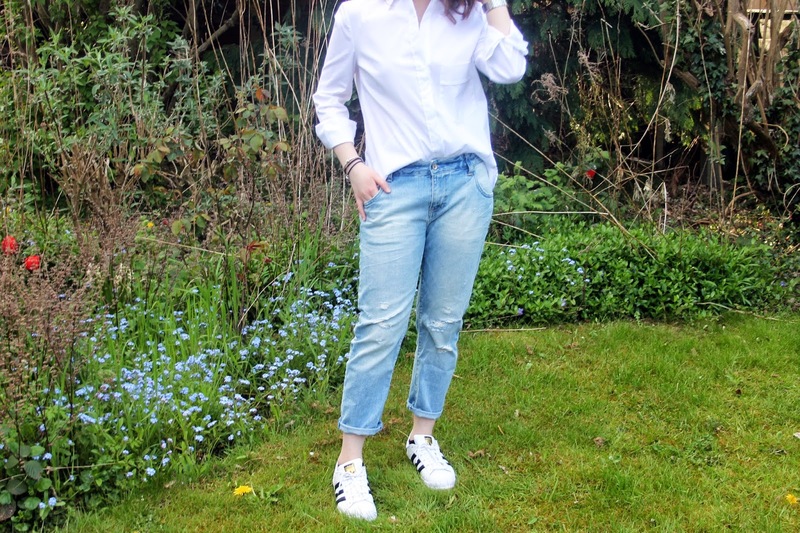 Since they have a sporty vibe attached to them, pairing them with a crisp white shirt and relaxed, distressed boyfriend jeans resulted in the shoes adding even more contrast and edge to my sophisticated, clean, casual outfit. So that wraps up my post for this week, I hope you guys enjoyed the outfit as much I did with experimenting and putting the whole look together. Stay tuned for Fez' post next week, you know it's gonna be a good one. Gloves have existed as an item of clothing throughout the centuries, much as shoes have provided a protection for the feet. Beyond the many practical purposes however, are other reasons that have determined the use of gloves in human habit.